The Village Idiot – January 2005 edition is now available for your bathroom reading material pleasure. Check it out here at the Village Idiot archives if you haven’t recieved it already. If you like what you read, feel free to sign-up for the next newsletter at the top of that page. Let’s face it, we’ve all been waiting for it, now it is here! Fortunetly, I was lucky enough to get my hands on a bottle of beer that I didn’t even know existed. 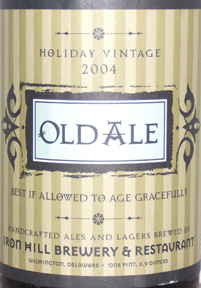 Some of the label information reads as follows: (on the front)Holiday Vintage 2004, Old Ale, Best if allowed to age gracefully, handcrafted ales and lagers brewed by Iron Hill Brewery & restaurant, Wilmington, Delaware, one pint 6.9 ounces, (on the side)Old Ale Vintage 2004: brewed naturally with the finest malted barley, hops and yeast. A dark full-bodied ale with a distinct sweet caramel malt and a complex fruity character. We recommend you allow this beverage to mellow over time. Please keep cool. OG:1080 ABV:7.2% IBU:25. From what the waiter told me at Iron Hill, this is a new feature that is about to become available at Iron Hill. Basically they will be brewing specialty batches of beer or chosing particular batches of beer and having them bottled and selling them only at the brewery where the beer was originally from. He said he thinks this should go live in about March. So, how did I get my hands on this bottle of beer you may ask? 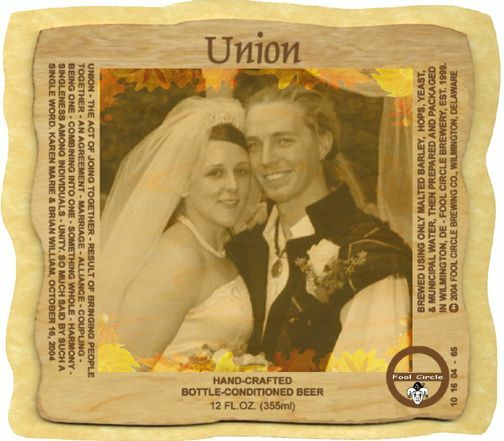 Well, while I was at Iron Hill Wilmington for brunch the Manager on Duty, Doug Frampton I believe, recognized me (my hair maybe) from when I came in and brewed with Brian Finn for the wedding. He must have said something to the waiter and the waiter said something to me. He then informed me that the manager was willing to see if they had a new bottle of beer if I was interested. Of course I said yes. Basically, by pure fortune, it appears that I have one of the first bottles of the first batch from the first Iron Hill restaurant to bottle their beer. What a really great company! Finally, the brew that was too good to last and didn’t have a label, gets its proper attire. If you couldn’t guess, this was the homebrew that I made for Karen and my wedding. Knowing that the beer would be kept in an ice chest there really wasn’t any reason to make a label at the time, the ice and water would just destroy it (who am I kidding, like I had the time!) Anyway, I just so happened across a couple (yes 2) random Unions and it reminded me I still needed to make a label, so here it is! 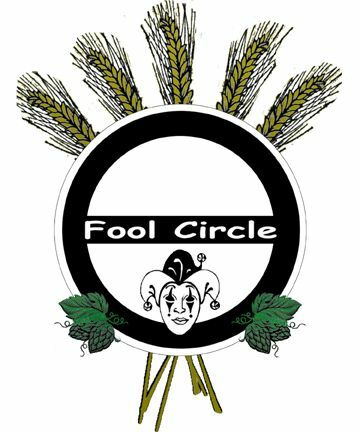 I am now reminded I have A LOT of updates that are needed for this page too, ALL of 2004’s brews, a new Village Idiot, and more up to date info on what’s a hoppening at Fool Circle. You are currently browsing the Fool Circle – Artisanal Ales blog archives for January, 2005.